Posted on January 27, 2019 by gayle. 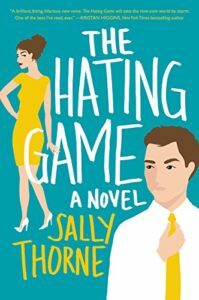 This entry was posted in Audiobooks, Fiction and tagged audiobook, palate cleanser, romance, sally thorne, the hating game. Bookmark the permalink. So amusing to read that you take your phone into the shower to listen to a good audio book, I have been doing that for a long time – nice to know there is someone else out there who does it as well. Also like you, I don’t plan my TBR. I read whatever calls me and definitely agree that you need to be in the right “place” to read a book. There is always a stack of books on my nightstand and I have a section on my book shelves of books I haven’t read it, just waiting for the call.